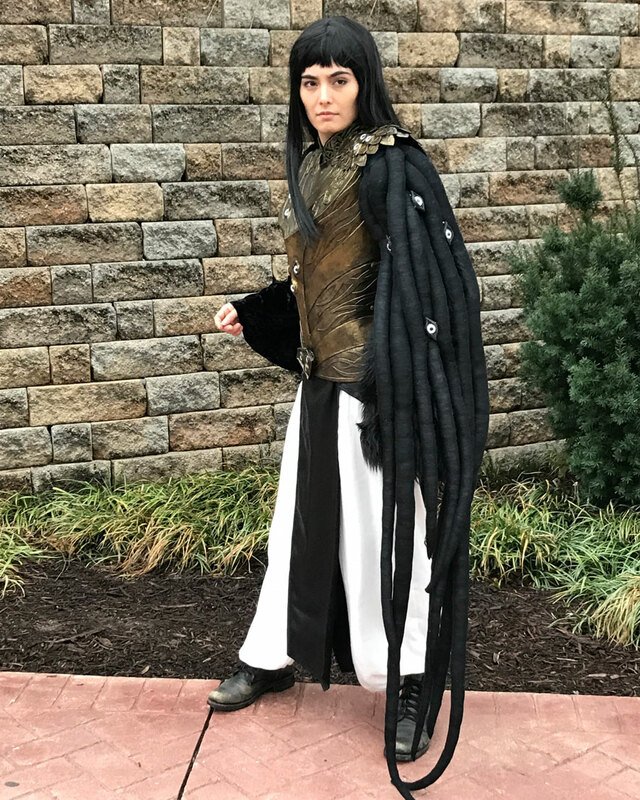 I think of myself as a process-focused cosplay craftsperson. 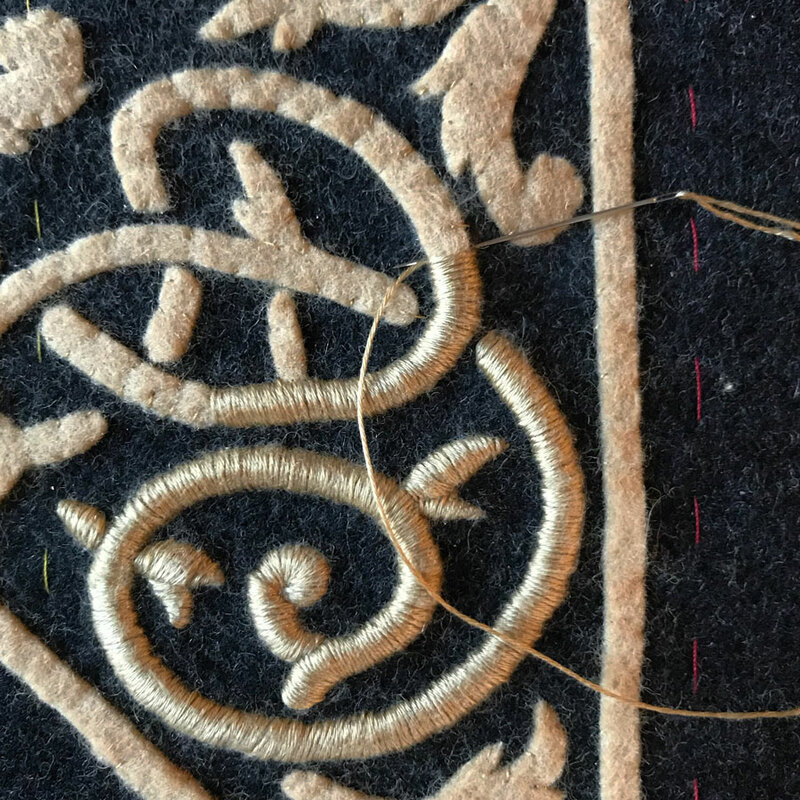 My main expertise is in sewing and needlework, but I love learning skills and trying new techniques. 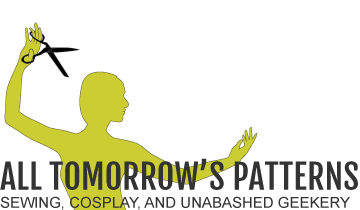 This page is a brief overview of my recent costume projects. 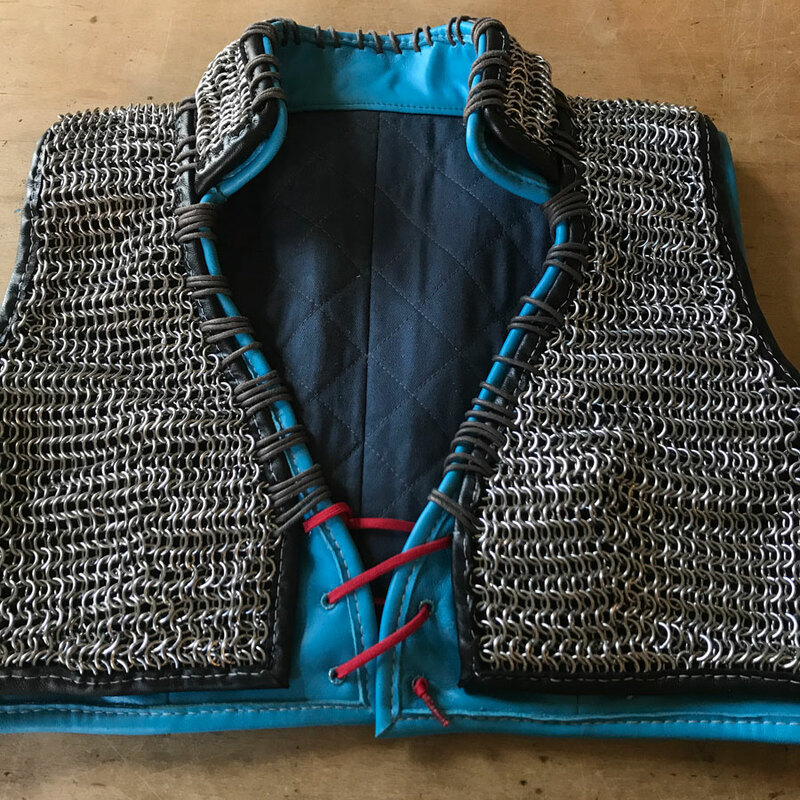 Ciri’s mail vest – steel rings, wool backing, leather base vest and bindings, with a cotton lining that I quilted for extra padding. All pieces made by me, including the mail and hand-sewn leather bindings. All the embroidery was satin stitched by hand in cotton floche thread over wool felt padding, on a wool melton base. In total the four panels required about 500 yards of embroidery thread and 200 hours of stitching. 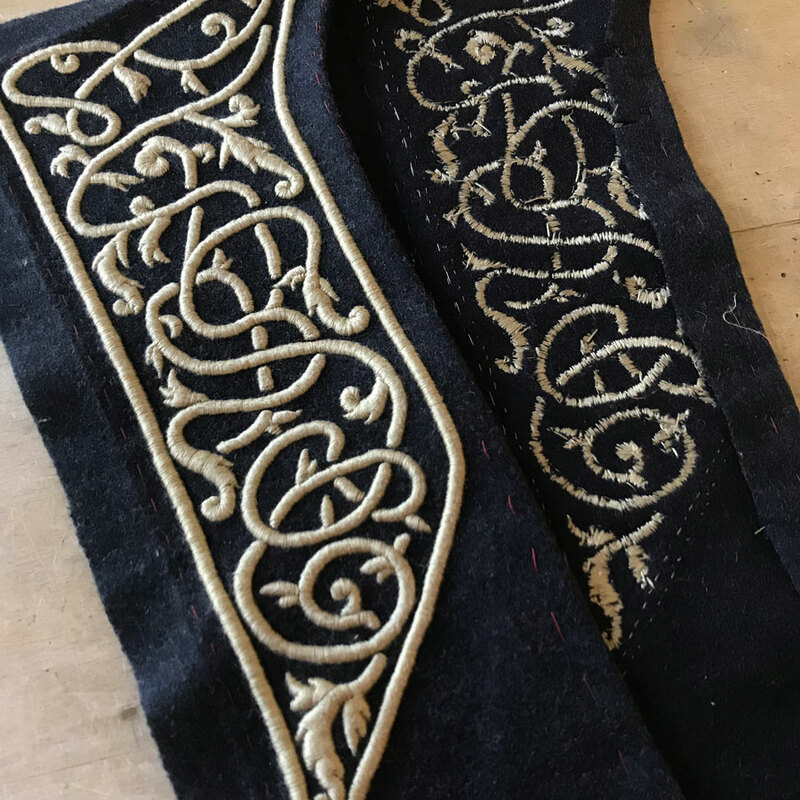 Detail along the upper edge of Ciri’s leg warmers, made from two types of braid sewn together by hand. 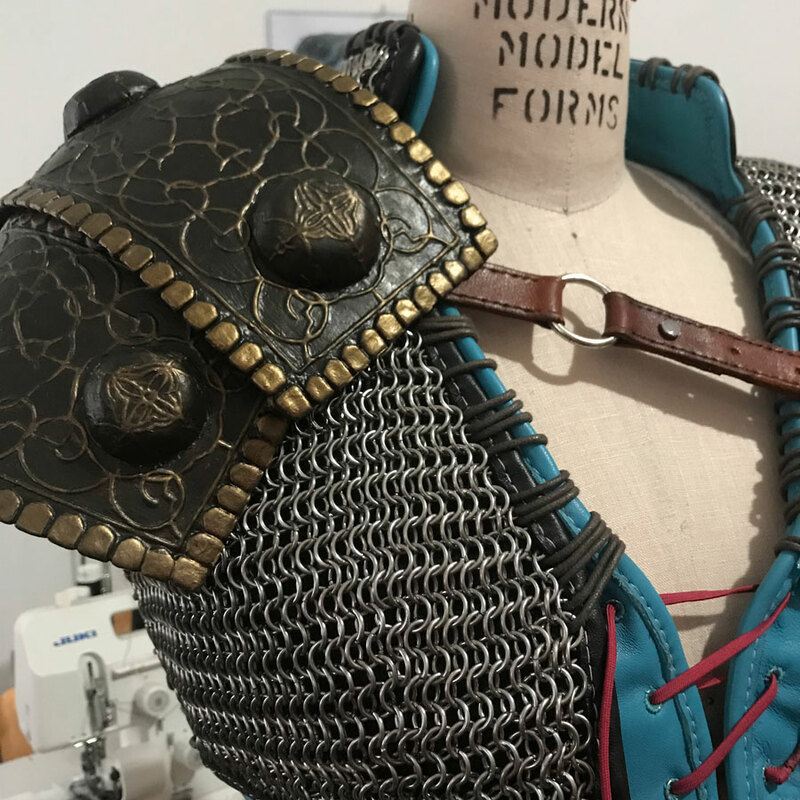 Pauldron made from worbla over buckram, with sculpted and puff-painted detailing and hand-stitched leather straps. 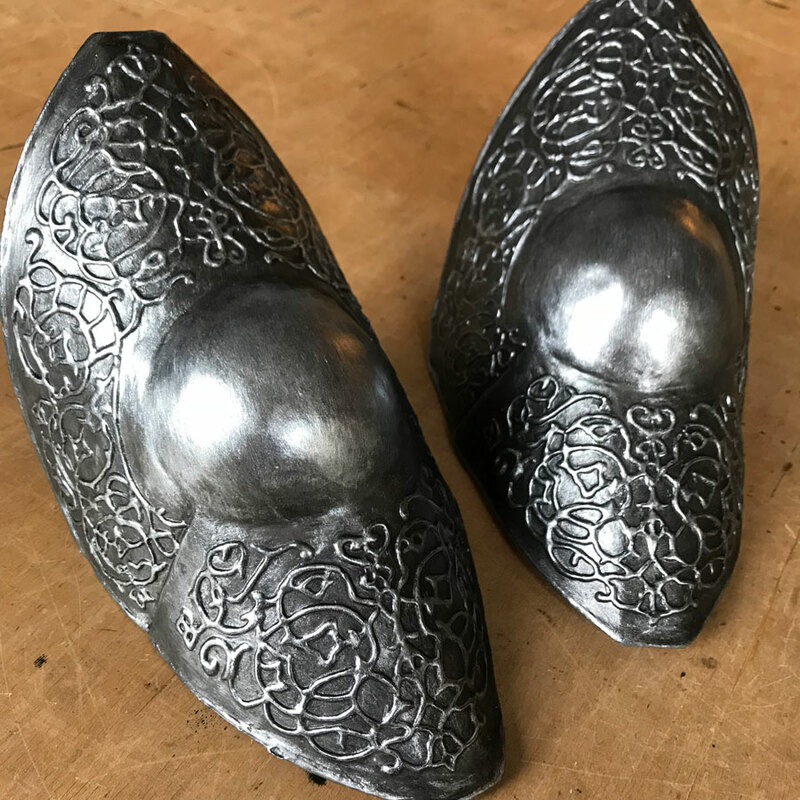 Poleyns (knee armor) for Ciri made from Worbla with cardstock backing and puff paint detailing, painted with metallic acrylics. 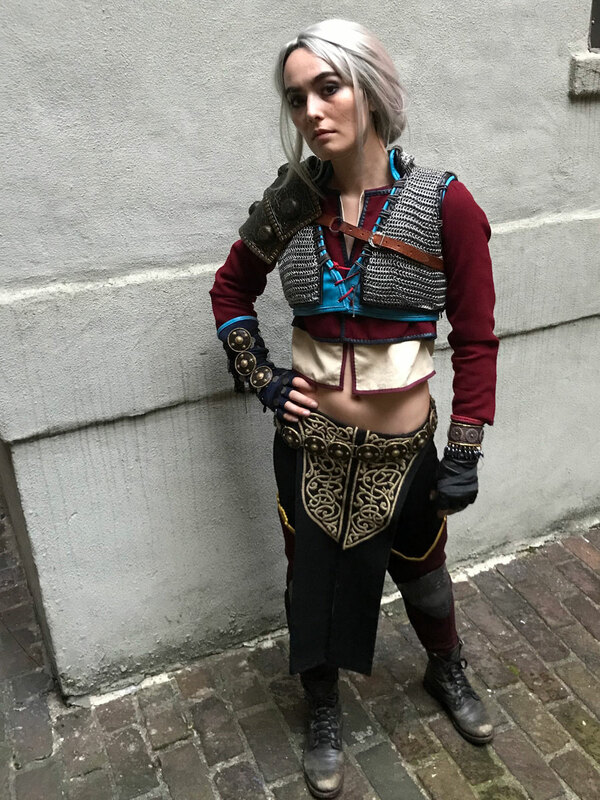 Ciri’s gloves, which I custom patterned with a cut-on thumb gusset for extra movement. All hand-sewn except for the side seams. 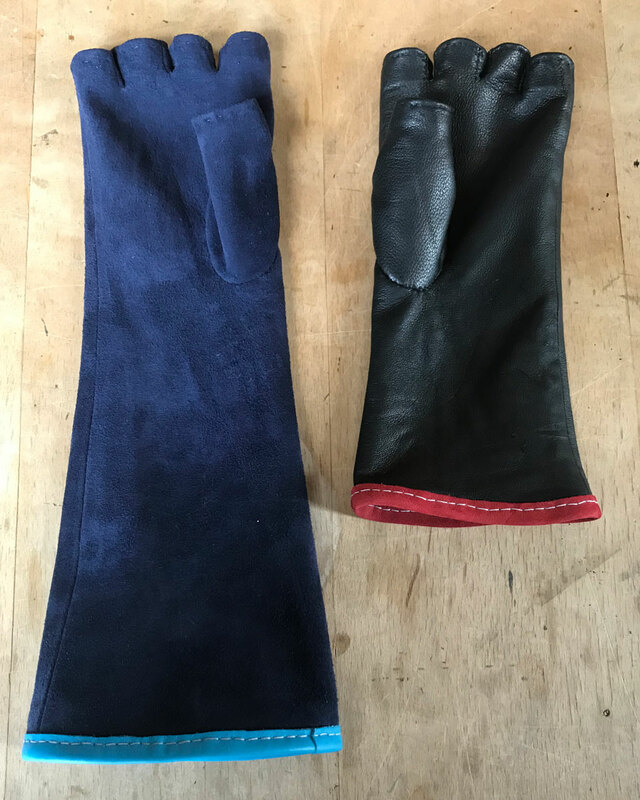 Both made from leather, with the suede side facing out for the navy glove. 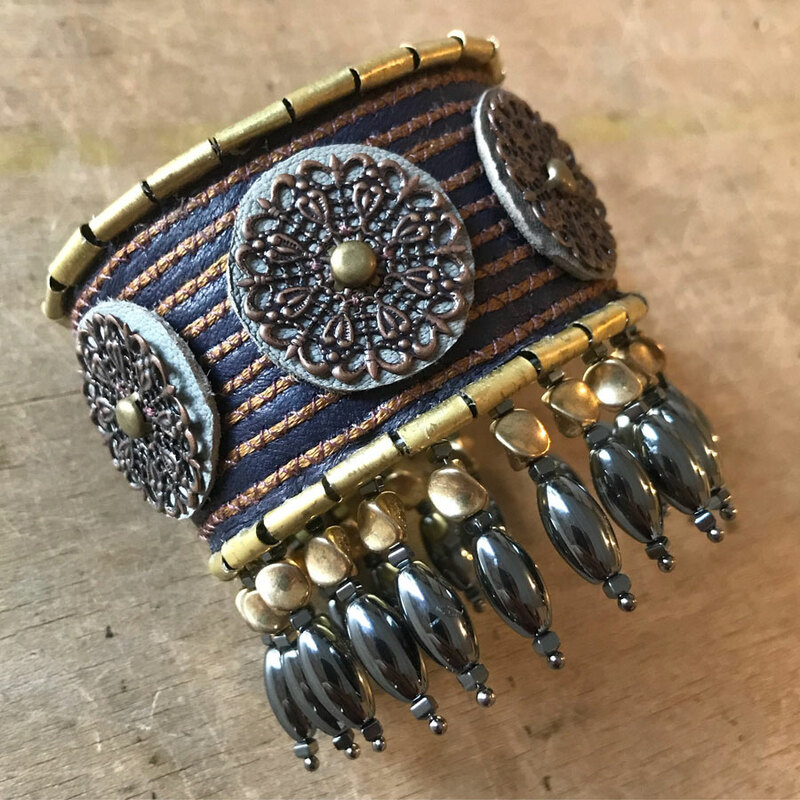 Ciri’s bracelet made from sheet brass, leather, wire, embroidery floss, metal and stone beads. 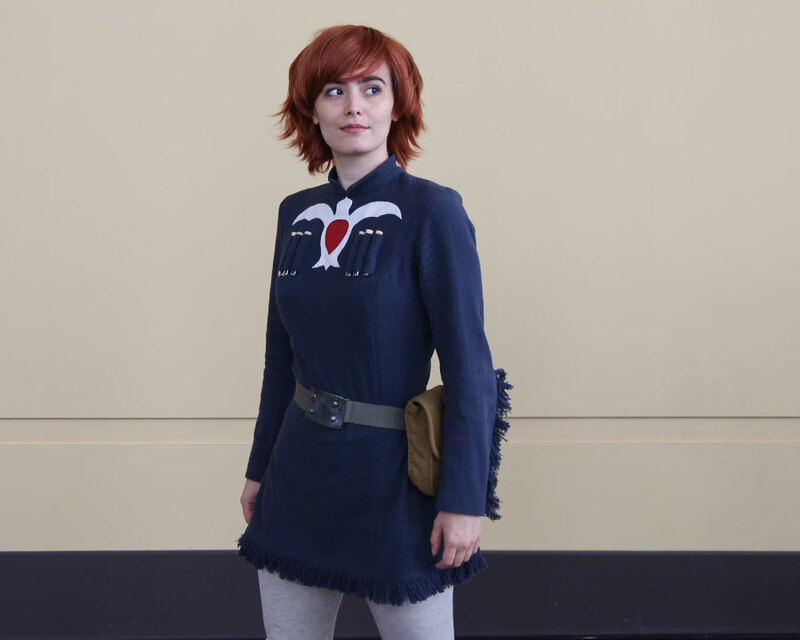 Nausicaa of the Valley of the Wind, first worn spring 2018. Homespun-look textured cotton with hand-sewn wool and silk appliqué and self fringe detail. Worbla and leather belt buckle, belt pouch in heavy wool twill. 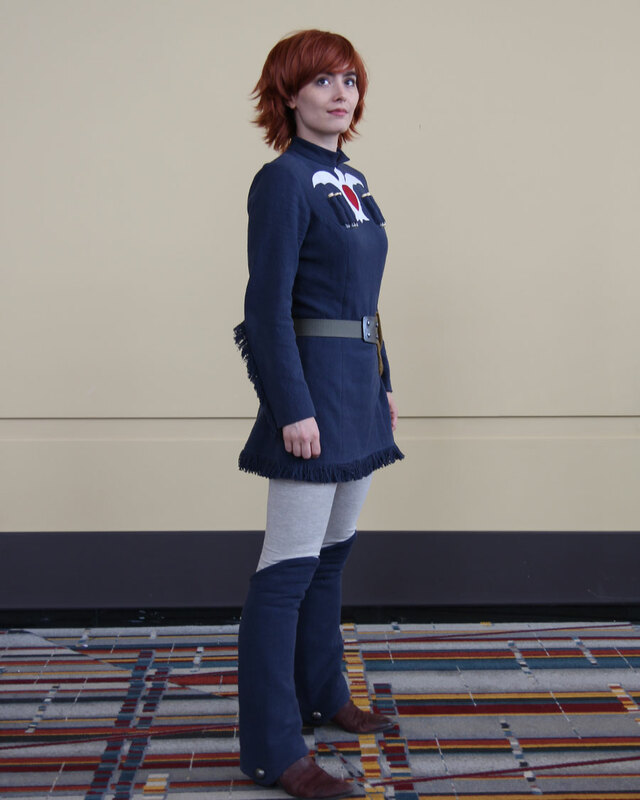 Full length view of Nausicaa. I decided the loops on the tunic would hold test tubes for samples instead of cartridges, as it seemed more appropriate for the character. Maika from Monstress issue 13 cover, completed and first worn February 2018. 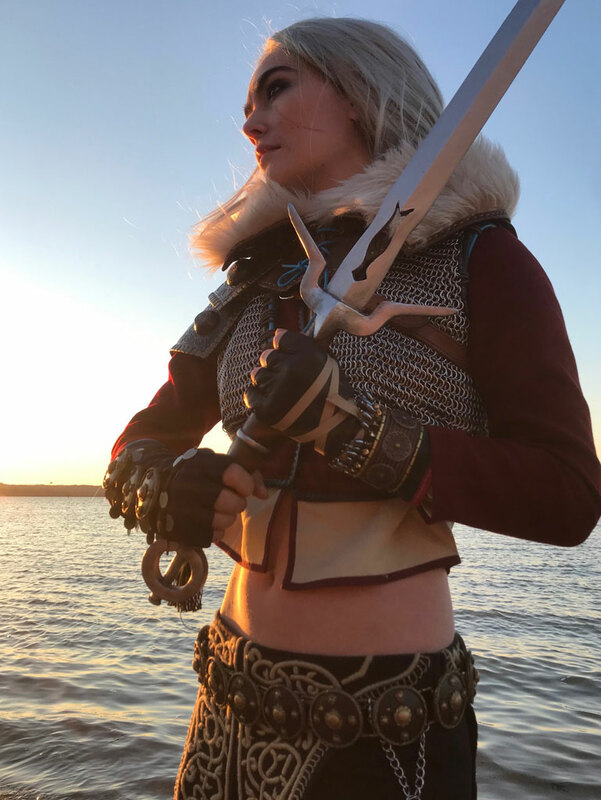 Armor made from worbla. Monster arm made from wool jersey and fiberfill, with additional glass eyes set in black worbla. The tunic is brocade with a snakeskin pattern and the pants are double gauze. Maika armor detail. 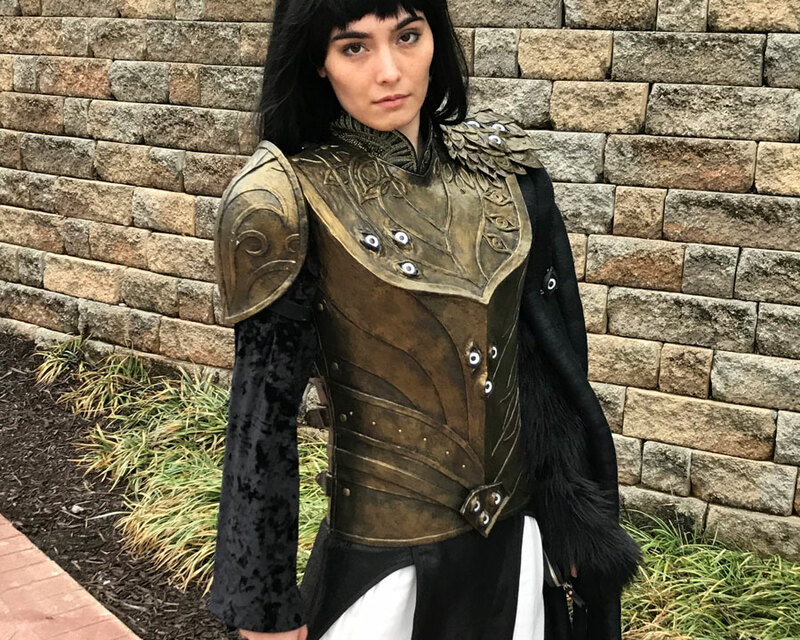 The armor is made from worbla, with glass cabochon eyes, and hand painted with metallic acrylics. 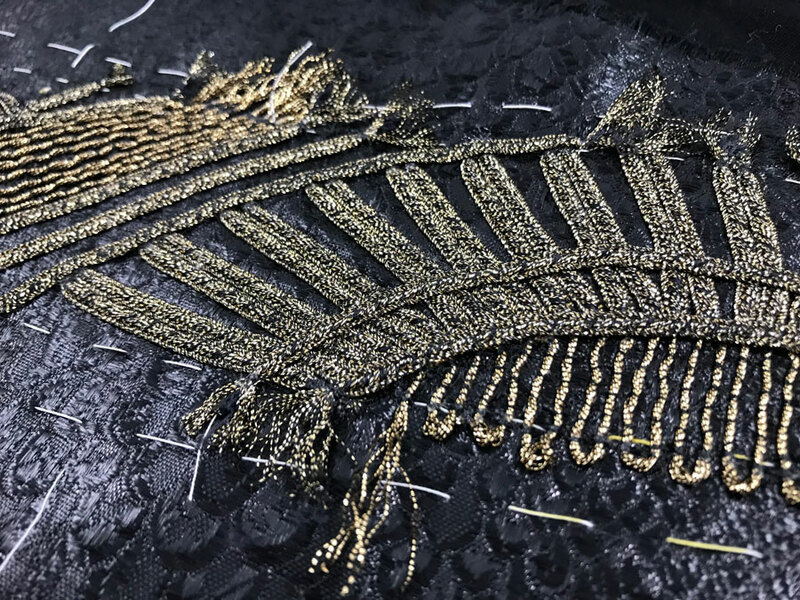 Detail of the Maika collar embroidery before it was assembled and attached to the tunic. Two different metallic braids hand-couched to an interfaced brocade backing. 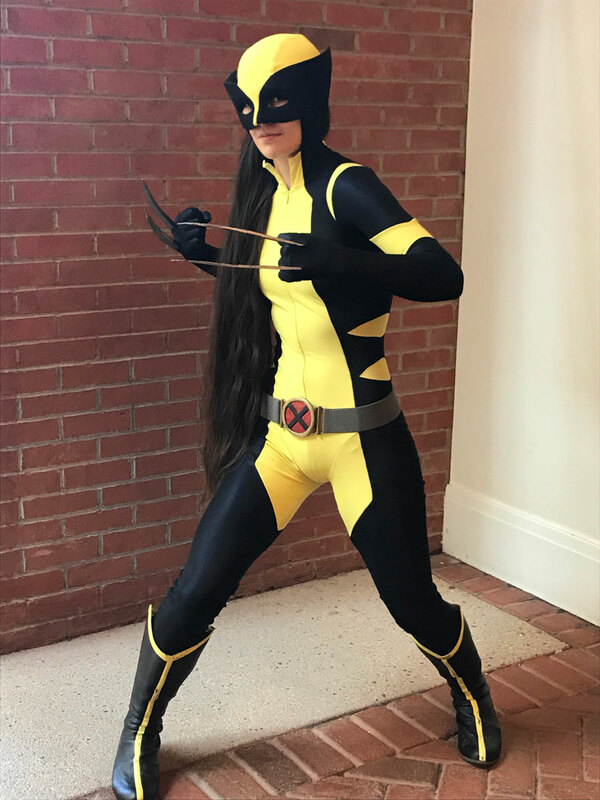 Laura Kinney from All New Wolverine, first worn September 2017. Yellow spandex double-layered for opacity, navy wet-look spandex overlaid with black metallic mesh. Gloves and cowl built into bodysuit, with wrist vents for hand access and slots in the back of the gloves to hold the claws. Worbla belt buckle. 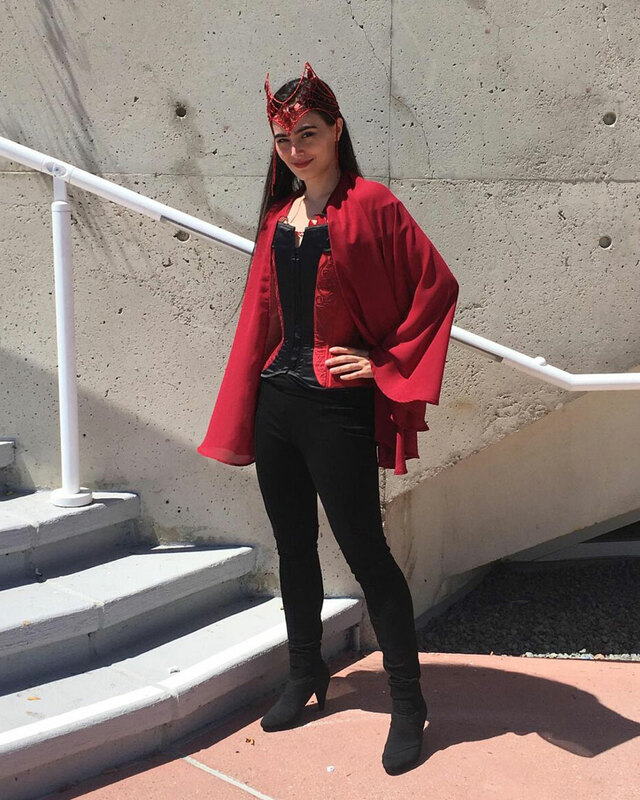 Scarlet Witch (Kevin Wada design), first made and worn in 2016. Red cotton sateen corset with steel boning, concealed front busk, and hand chainstitch embroidery. The tiara is made from glass beads strung on wire. 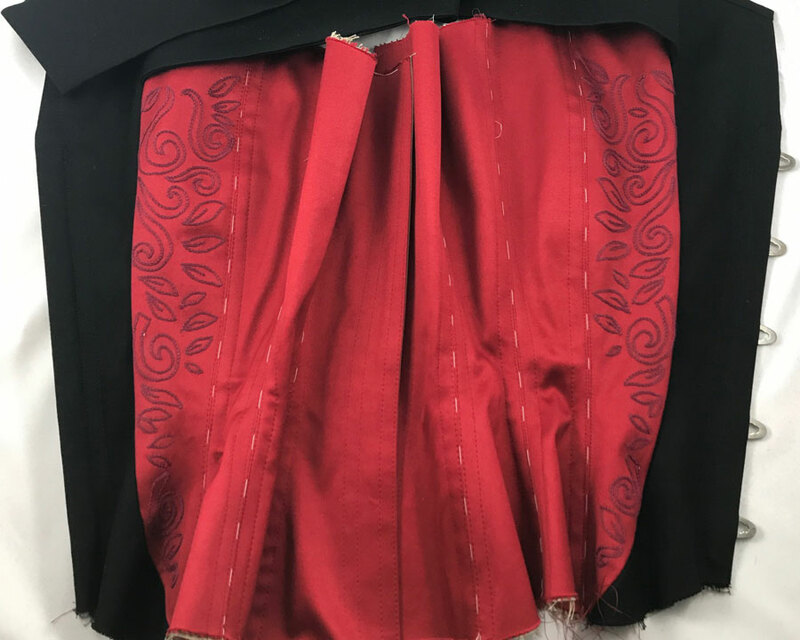 I remade the Scarlet Witch corset in 2017 with better quality materials. 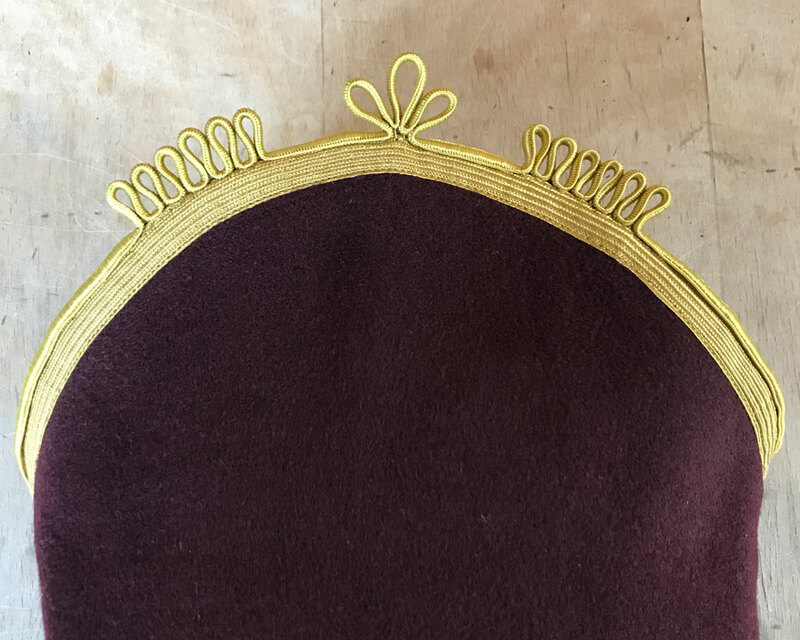 This unfinished shot shows the hand embroidered front panels, as well as the basting holding the layers together for accurate stitching of boning channels.